From decorating clothing and accessories to adding flair to your scrapbook layouts, there are lots of ways you can use stencils in your crafts. While there are many great options for sale in stores, you can stretch your crafting budget by using free stencils you download online. If you have a computer and printer and know how to paint with stencil designs, you'll have unlimited options for creating beautiful and budget-friendly projects. Click on the image of the stencil you want and save it to your computer. If you need help with the downloading process, check out these tips. Decide on the size you would like the stencil to be and enlarge it accordingly. Print the stencil on card stock or your chosen material. Use a craft knife to cut out the stencil design. Apply the stencil as desired. 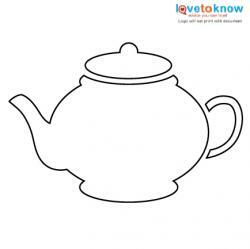 Stencil the teapot design on card stock to create unique tea party invitations. Use fabric paint and this design to make a kitchen towel that you can give to a friend as a hostess gift. Stencil this design on the wall of a child's room for a tea party theme. Paint the bottom of a serving tray with this stencil and chalkboard paint for a cute entertaining item. Give your kitchen a cafe theme by painting a border of cups above your cabinets. Stencil a large tea or coffee cup on a t-shirt with fabric paint. Once the paint is dry, use fabric markers to write your favorite message. Try "Coffee first. Talk later." Use fabric paint to stencil large mugs on the back of fabric chair covers. 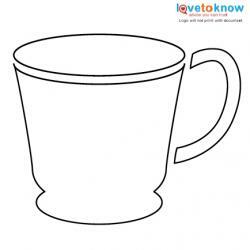 Then write each person's name on the mug for a cute take on place cards. Stencil mini-teacups on scrapbook pages that feature your favorite little girl having a tea party. 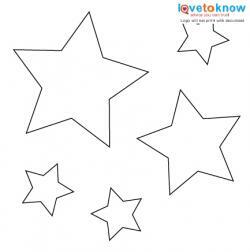 Using glow-in-the-dark paint, decorate the ceiling of a child's room with lots of sweet stars. Add some extra personality to an old pair of jeans by stenciling black stars up the legs with fabric paint. Turn a plain piece of black fabric into a wizard cape by stenciling fabric paint stars on it and attaching ties for a closure. Give a poster some extra visual impact by stenciling stars on the border. 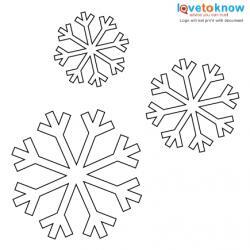 Use spray snow to stencil snowflakes on the windows of your house. 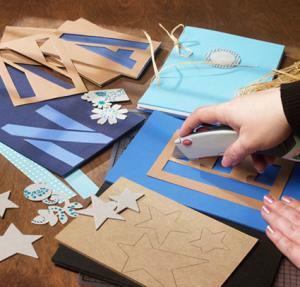 Make your own gift wrap by stenciling snowflakes on plain brown paper. Decorate kitchen towels to give as a holiday hostess gift. Simply use fabric paint and these stencils. Make winter-themed glasses by using these stencils to etch a snowy design on plain glassware. Use bright fabric paint to stencil a simple cotton pillow cover in colors to match your living room. Give a teen's room retro flair by stenciling paisley designs on the walls. Upcycle an old dresser or end table by painting it solid white or black and then adding paisley designs in a fun shade. Can't find the right fabric to match your decorating needs? Make it yourself with some plain cotton, this stencil, and the perfect shades of fabric paint. Dress up a plain knit skirt by stenciling a single feather near the hem. Skip the wallpaper and use paint and this stencil to create a focal point wall in a bedroom. 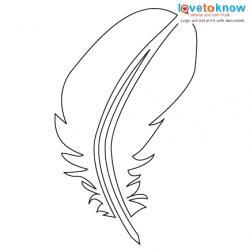 Create sophisticated and elegant greeting cards by using gold paint to stencil a feather on blue card stock. Make a statement by stenciling a plain purse or tote bag with bright fabric paint in a feather design. Spray Paint Stencils - This site has lots of cool designs, including animals, people, plants, and much more. All designs are free for personal use. Free Stencil Gallery - This is a great place to find stencils relating to geography, books, music, and people. All designs are free. Allaboutstencils.com - Although this site sells stencils and supplies, they also offer many lovely free designs. 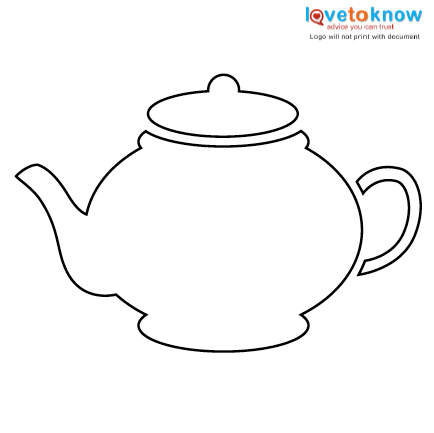 You'll find flowers, animals, and abstract shapes here. Pumpkin Pile - If you want free stencils for decorating pumpkins, this is a great source. You can also use the designs, which include cartoon characters, celebrities, and animals, for other projects. No matter what kind of project you are creating, there's a free stencil out there that will be perfect for it. You'll find that these gorgeous designs are inspiring, and soon you'll be coming up with lots of ways to use these images to decorate your clothing, home, and other craft projects.